Ok, I do tend to crush on visual artists, or their art. And dancers. And performers, especially drummers and bass players. And pretty much anyone who shows mastery of their creative trade in a public setting. Since I can’t draw a straight line, my longest running crushes are on visual artists. Writing a song or score- no problem- but sculpture, painting, life drawing seem mystery skills; to be around experts makes me SpongeBob giddy. Evidence of artist crushes I’ve shown on this blog previously are here. And here. 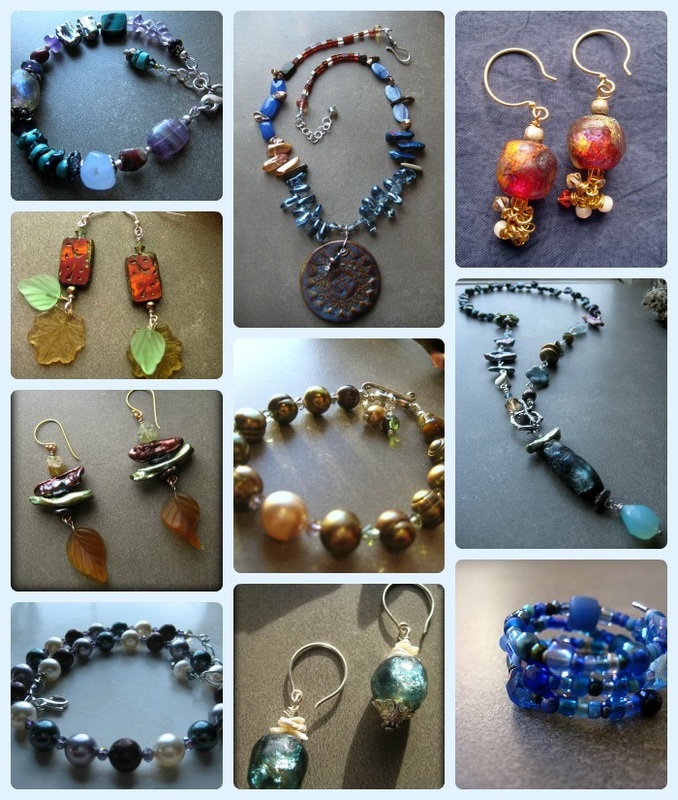 So, I have mentioned lots of artbead artists on this blog before, but in this new forum- I hope to delve deeper; interview them and find out some cool day-in-the-studio wisdom. 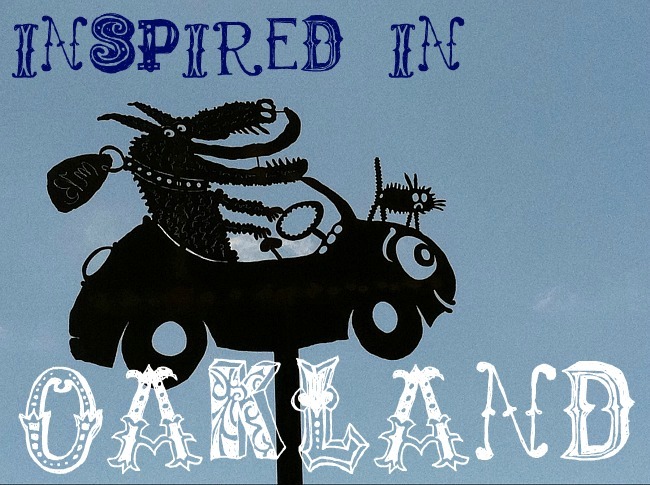 For now- the artist who’s work is inspiring mine is- Charlene at Black Mud Studios. And though I haven’t interviewed her yet, I wanted to share a recent challenge she gave me. 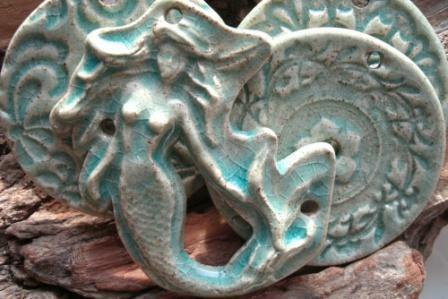 I’ve been working with her stoneware pendants for sometime. Charlene and her studio are in Ontario, Canada. 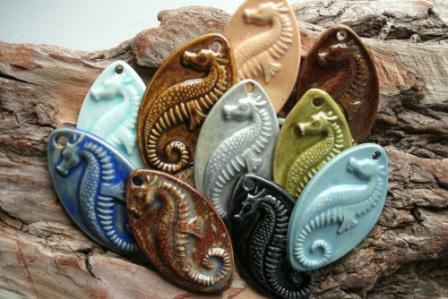 Her pendants are sizable, beautiful with unusual detail, and well-priced. Her natural & gloss finishes are just plain fun to design with. Recently, before placing my Spring order, Charlene challenged me to make her a necklace that could match multiple pendants. At first I thought- ‘ah, piece-o-cake.’ But then, I find out she wears only short necklaces- 15.5″ (gulp.) And that she wanted them to match interchangeable pendants (2x Gulp). Of varying finishes/colors (3xGulp). So short length means there isn’t a whole lot of space to be elaborate in the design, since what is visible in front- is less than half of the necklace. I studied Charlene’s new finishes, and tried several things. 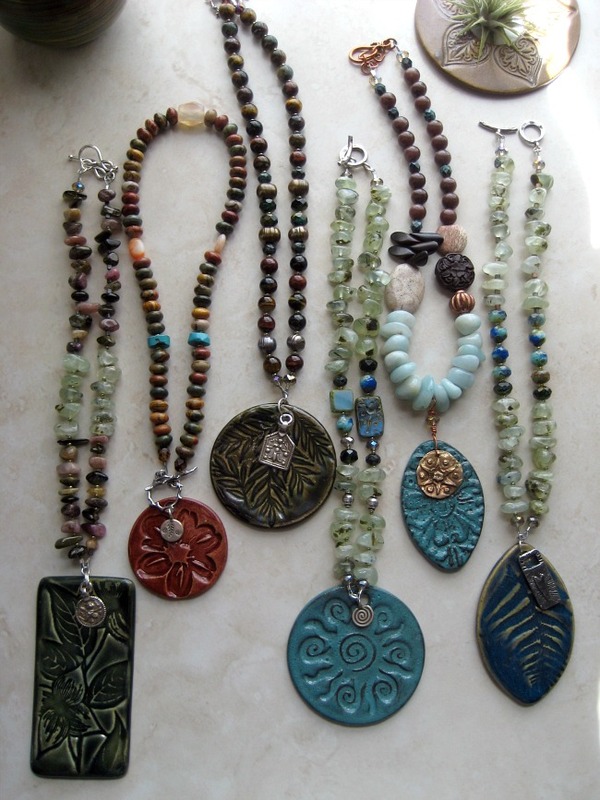 One is a finished piece but the rest can have pendants easily attached to front or back clasps. I just love her leaf details! The one on the far left is a dogwood design. These are generously large pendants! We’re talking 3-4+ inches many of them. So If you like large focals- Charlene’s is the place to get them. I experimented w/ U and V shaped necklaces, and learned that unusually shaped pendants look great in the V-shape. Still trying different things- but stringing with large stone chips and pieces is looking right. I’ll post soon to my Etsy store. Another reason to love Charlene’s work- mermaids! And Seahorses. Bees and sugar skulls!! 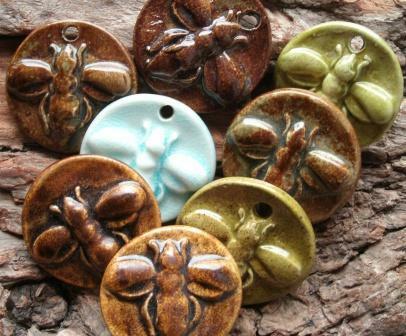 Charlene makes lots of buttons, cabachons, links, cool bracelet links, sea creatures, leaves, and other amazing fun pieces, and usually shows us right away on her Facebook page here. 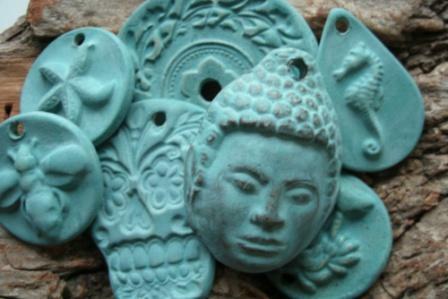 So stop by Black Mud Studio on Etsy or FB and see what Charlene’s kiln is cookin’ up! The work is lovely! Definitely going to check out her shop! btw- I LOVE your article in Trends mag this month. Kudos! What lovely work! 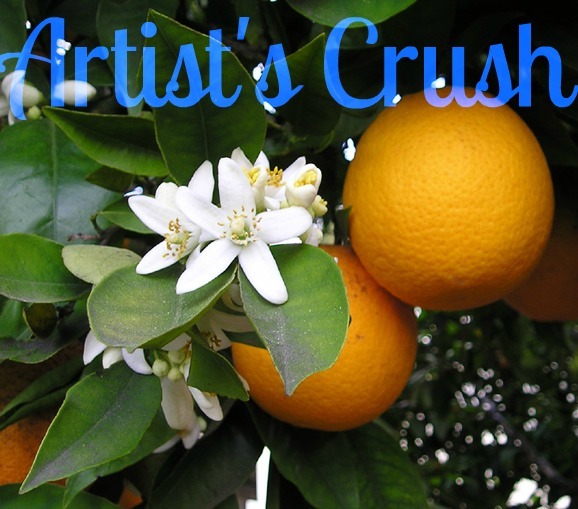 No wonder why you have an artist crush! Totally crushworthy! OH and I REALLY love the way the bronze looks against that rich turquoise glaze. It’s very opulent looking. Nicely done… both of you! I’ll definitely have to swing by her shop and take a gander! P.S. I have an artist crush on Anne Choi too!